Compile errors due to a difference in how the control libraries are registered in 32 bits Windows' System32 and 64 bit Windows' SysWOW64 folders. If you distribute a file that was saved in 64 bit Windows, containing one of the "Microsoft Windows Common Controls 6.0" (The Treeview control is one of them) and with the reference set to "mscomctl.ocx", people using 32 bit Windows will almost certainly have problems. At best it could entail removing both the control and the reference and replacing both, but at worst the user's Excel can crash when trying to load the file and run the app. In the following pages I'll show what our treeview can do and explain how to put it to use in your own VBA project. MAC Office and 64 bit Office Compatible! The basic plumbing and code structure of this treeview control was devised by me. However, without the help of my friend and fellow MVP Peter Thornton, lots of functionality would not have been available now. For that I sincerely thank Peter! Also: Fellow Excel MVP Ron De Bruin ensured the treeview also works on MAC Office 2011, Thanks Ron! All code in the treeview is (c) JKP Application Development Services and Peter Thornton (the Authors). It remains our sole intellectual property. However, we're offering this treeview to you at no cost. You get an unrestricted license for use in any VBA project you like. You're free to modify any part of the code at will. Keep our comments in place. Do not remove our names and url's and email addresses from the code. Send us your praise and your comments. Send us any functional additions you do the the treeview. And please mention the source of the treeview (including a link to this page) in your helpfile, manual and/or on your about screen. We're always interested to see how people have implemented the VBA Treeview. So please feel free to send a screenshot with a brief description or relevant details. You use this control at your own risk: The authors accept no liability whatsoever for any damages which may arise due to the use of our treeview. Many, many hours were spent developing this treeview. Although we developed it for use in our own projects, we are giving it away for free! The Excel workbook contains most of the documentation (on the tabs of the workbook), so I recommend you to at least download the Excel version. 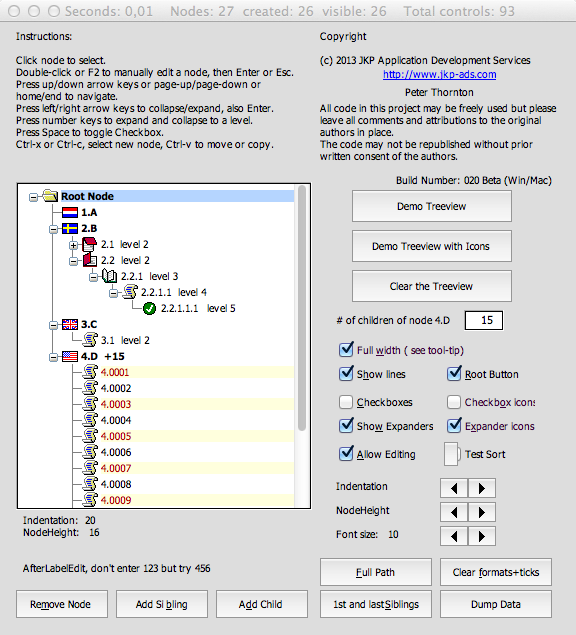 The Access version has instructions on its main form (click the "How do I...?" button) on how to implement the treeview in your own projects. The professional version of the treeview control has exceptional performance. Even with tens of thousands of nodes it will load quickly and remain highly responsive. It also has several new features including drag and drop. Our new ListGrid combines most of the functionality of the ActiveX Listview and Flexgrid controls with many extra useful features. It is the result of extensive beta testing by some of our treeview users, thanks guys! The screenshot of the demo below gives an idea of just some of its capability. The Pro Treeview and ListGrid are available for 32/64 bit Excel and Access. The Excel version will also work in Mac, one or two features are disabled for Mac but we’re working on it. Unlike our free treeview they are self contained in their own files and designed to work more like real controls. Please note that the pro versions are paid versions. Pricing available upon request by using the links above. Another often used control is the calendar control. This control has the added problem that it has been deprecated with Office 2010 (where we're supposed to use the date picker control). Frankens Team created an all-vba alternative using very similar techniques to what we've done here. Ron de Bruin created a Date Picker control for MAC Excel. We are currently developing a listgrid/listview control. Contact us if you would like to participate in the beta program. Note that this control will not be made available as freeware. Guillermo contacted us via the 'Pro Treeview Enquiry' link above, it is now fully implemented in his application. See 'Extended Project Explorer' in the examples link. Note this example uses an earlier treeview version. Is it possible to create a rtl Tree? does it support it? What is an rtl tree? I mean right to left view for non-English languages. I am a co-developer of the treeview. It does not support 'right to left' view and we have no plans to adapt it. It would be difficult without a 'rtl' system available. Thank you, this works very smooth!... Good documentation too. There is a link to a very good one on this page!